Installation of 2000m² of Flowcrete Flowfast Terrosso to main atrium and stairweklls. The decorative terrazzo effect finish was installed over 3 weekens to ensure tight programme was adhered to. South Cheshire College’s new state-of-the-art, low carbon development is set to lead education in the Crewe and Nantwich area into a new era. As well as extensive social areas with first class education classrooms South Cheshire College provides vocational facilities and workshops. Architect for the eye-catching, sustainable campus was Jefferson Sheard of Sheffield and Peterborough, and the building was constructed by BAM Construction. 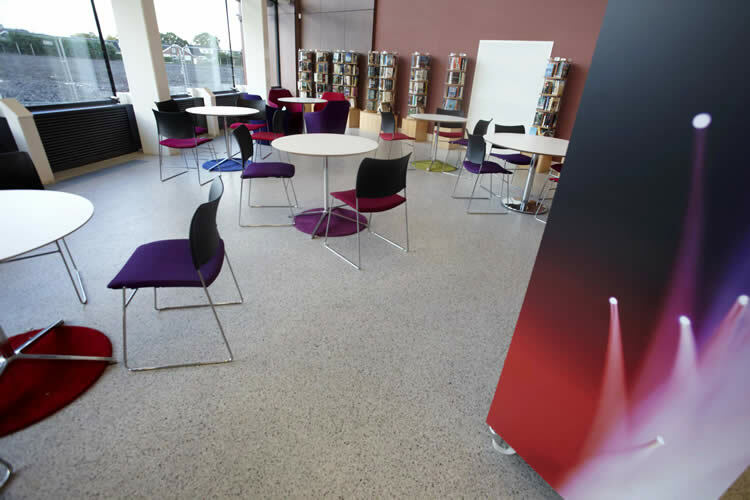 As an integral part of the overall design, it was clear that an innovative flooring solution would be needed to withstand the high volumes of traffic and also meet the sustainability features required for this high profile project. 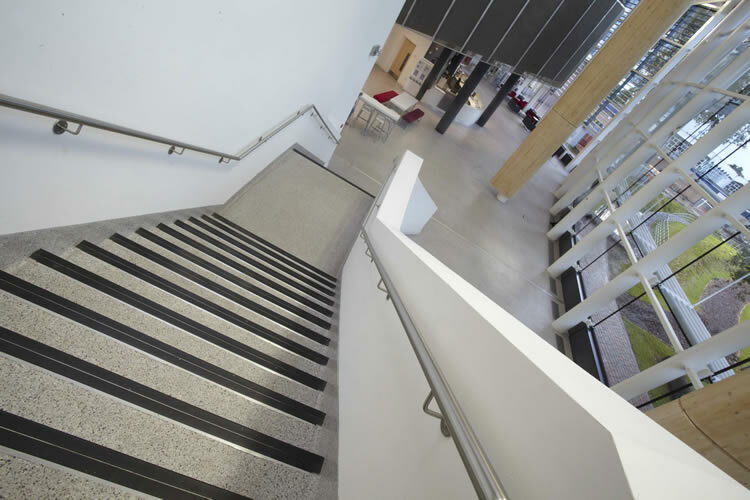 Q Flooring Systems Ltd fought off tough competition to win this prestigious project and install 2000m² of Flowfast Terrosso to the main atrium and stairwells providing a decorative terrazzo effect resin flooring contemporary finish. 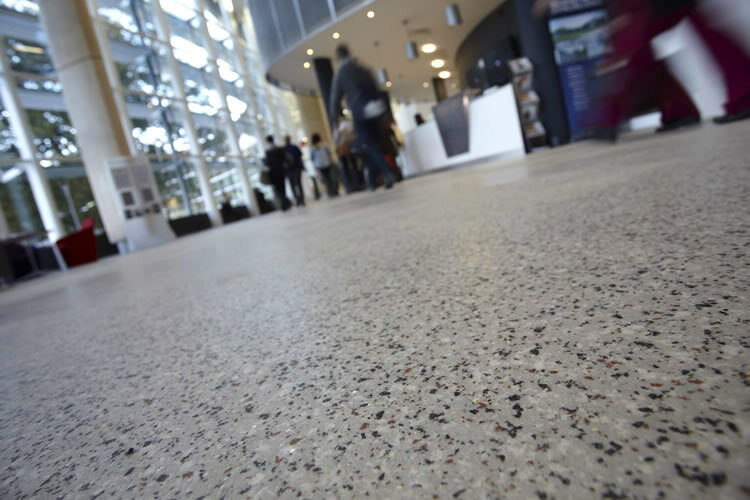 The solution would give a seamless, hygienic, robust and beautiful finish which would last for years to come meeting all sustainability requirements. Works were completed over 3 weekends to ensure follow on trades work was not affected. 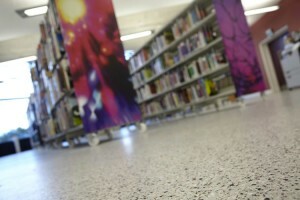 Each phase was completed and fully cured for Monday morning to tie in with the strict programme. Specific design issues were dealt with by Q Flooring Systems Ltd at an early stage to engineer out any risks. Approximately 50 electrical floor boxes were taken off site and individually finished in Flowfast Terrosso. 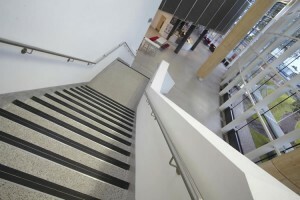 All the treads and risers to the stairways had to be finished in resin to maintain the seamless finish throughout and certain areas of the atrium had to have anti-slip properties, particularly the entrance area without affecting the decorative finish. Everyone involved in the project was delighted with how smooth the project was completed and Mr David Kidney, Minister for the Environment said “I was particularly blown away by the new campus and the environmentally sustainable features of the project. Everyone who has been involved in bringing the new campus project to fruition deserves a great deal of credit for what they have achieved”. Q Flooring Systems Ltd have completed numerous BSF (Building Schools for the Future) projects throughout the UK including Poynton High School and the Manchester Communications Academy.